Large numbers of people were drawn to the ministry of John Calvin (1509-64), one of the principal figures in the sixteenth-century Reformation, and, such was their respect for him that, when he died, almost every person in Geneva attended his funeral. Today, John Calvin is best known for his grasp of profound theological issues, his rediscovery of the doctrines of grace, and especially for his Institutes of the Christian Religion. However, Calvin was no ivory-tower academic or dry theologian, remote from the concerns of everyday life. He served for many years, in both Strasbourg and Geneva, as a caring pastor and a faithful preacher of the Word of God. As relevant today as they were when they were first preached to a congregation of French refugees in Geneva, these selections from Calvin’s ministry on the Pastoral Epistles come from a heart aflame with devotion to God and love for the people of God. Their theme is the grace of God revealed in Jesus Christ and applied to God’s children by the Holy Spirit. 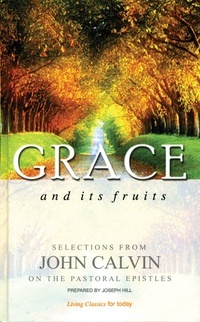 Grace and Its Fruits provides a rich selection of Calvin’s sermons, sensitively presented in contemporary English by Joseph Hill for a new generation of readers.